Our programs provide you with more than just tools to print checks and forms. 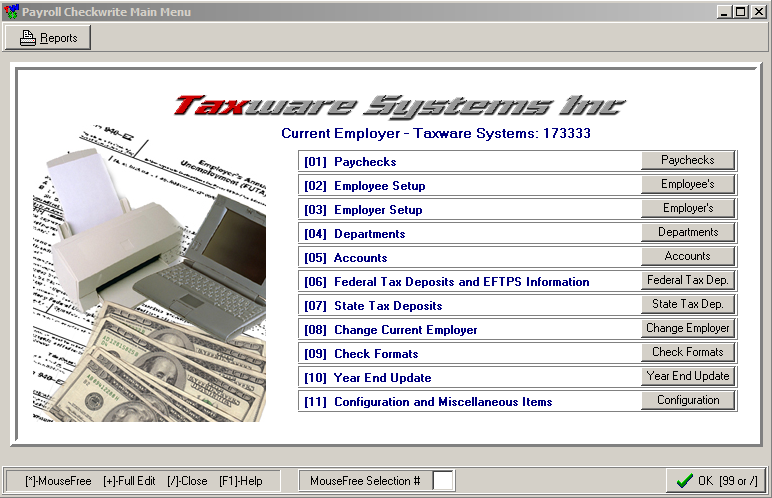 Taxware Systems offers a complete line of payroll and accounting programs including: Payroll Checkwrite, After the Fact Payroll, General Ledger/Client Writeup, 1099 Accumulator and Money Manager. Our programs provide you with more than just tools to print checks and forms. Taxware’s payroll and accounting programs are flexible and can be customized to meet the needs of any business. Winpay is a payroll check writing program that you use to easily calculate and print payroll checks. It can be used for your firm’s payroll or to process payroll for your payroll clients. Paychecks can be printed on preprinted or blank check stock (8.5″ x 11″) using an HP compatible laser printer. Federal reports are included in the program (e.g. 941, 940EZ, W-2). Money Manager is a simple, single entry bookkeeping system that will sort transaction into business, personal rental, and personal income tax related items. As many as nine business and rentals may be used. Summary reports, such as profit and loss statements, can be printed or viewed at any time. These reports generate information that is directly compatible with tax returns and may be used by calendar or fiscal year entities. The reports may also be printed in detail form. 1099 Accumulator is used to quickly enter transactions that will go to a 1099 Miscellaneous form. Non-employee compensation, rents, royalties and other amounts can be entered. The various versions of the 1099 Miscellaneous form (e.g. federal, state, or file copy) can be printed. A federal copy can be printed on preprinted paper or submitted using the IRS F.I.R.E. system. Detailed reports can be viewed or printed in either non-employee transactions or summary totals for each employee.